If a new ship could blog, what would it say? Tuesday: Italy is a nice place to grow up. The food is great, and I can’t wait to try my first espresso. I’m getting bigger by the day, and the doctor says I’ll grow to be larger than my sisters by 63 whole staterooms. Won’t they be jealous? Given that [% 9823 | | Holland America’s %] ms Eurodam is perhaps too young to write, the cruise line has enlisted some people to do it for her. 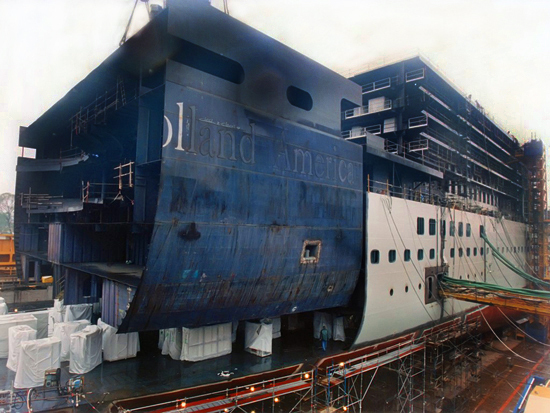 The Eurodam News Blog will feature updates on the ship’s construction, amenities, public rooms, menus, itineraries, and staff, as told by five Holland America employees. Readers who are curious about the first ship in the new Signature Class can post questions and comments online. The writers include the Vice President of Public Relations, the Director of Deployment and Itinerary Planning, the Director of Newbuilds, the Eurodam’s Hotel Manager, and the Vice President of Marine Hotel Operations. This diverse bunch will offer a variety of perspectives on the new ship as the countdown continues toward her launch date in June 2008. Kudos to a traditionalist cruise line for heartily embracing the Internet and experimenting with new ways of communicating with its customers. It looks like the Eurodam will lead her sisters confidently into the future of cruising.